Jean Valjean, a good and honest man, stole a loaf of bread to feed a starving nephew. He then spent 19 brutal years as Prisoner 24601 in post-revolutionary French prisons, paying for his crime. Following his parole, Valjean has little hope of surviving, short of turning to a life of crime. The compassion of a priest gives him a new lease on life, and he defies the terms of his parole and starts a new existence, becoming a mayor and a successful, respected businessman. Years later, a ruthless and merciless inspector of police, Javert, finally catches up with Valjean and is determined to return him to prison for violating his parole. Valjean, however, has promised a destitute factory worker, Fantine, that he will care for her young daughter, Cosette, who has been in the questionable guardianship of some innkeepers of ill-repute, the Thénardiers. So Valjean rescues Cosette and flees from Javert, living quietly in seclusion for many years, raising his adopted daughter. Lives and circumstances collide during the June Rebellion of 1832, and Valjean again comes face-to-face with his nemesis, Javert. But he also must come to terms with the fact that his daughter is no longer a little girl and, in fact, Cosette has fallen in love with Marius, a student leader in the rebellion. Further complicating this relationship is the fact that Eponine, the daughter of the Thénardiers, is also in love with Marius. An ill-fated barricade in the streets of Paris brings all of them together and sets the stage for resolution and absolution. Les Misérables is hardly the first adaptation for stage or screen of Victor Hugo’s masterpiece, but this masterful imagining is unique in many respects. It is important to understand first that this is a musical production in the truest sense of the word; there are scarcely 20 lines of spoken dialogue in the entire 157 minutes of film. One of the advantages I believe musical theater has over film musicals is the ability to infuse spontaneous, raw emotion in the performance of musical numbers. Live performances are always new, and an actor can add slight nuance and variation from performance to performance, finding subtle ways to reveal the truth of the moment. They are not limited to a rigid recitation and are free to experiment with syncopations sympathetic to their emotions. They are, however, physically locked to a stage, so the audience must choose for themselves where to direct their attention and what to focus on. A film director, on the other hand, has the power to control the viewer’s gaze and to introduce a multitude of visual references to enhance and underscore the performance. However, because film is made up of thousands of tiny clips stitched together to tell a seamless story, the individual bits and pieces must have some commonalities that allow them to cut together. Dialogue is relatively simple to splice together, as long as the lines are the same (or at least very similar) from different takes of the same scene. Spoken lines are one thing, but sung lines are another entirely, and two performances of someone singing are virtually impossible to mesh together for a host of different reasons. So what we are typically left with in movie musicals is a pre-recorded musical track that actors then sing-along to, basically acting with their bodies while lip-syncing with their mouths. It works well enough, obviously, because we’ve been enjoying musicals for 80 years or so that were filmed in this fashion. What director Tom Hooper (who also directed the brilliant The King’s Speech in 2010) set out to do -- and did -- with Les Misérables was to somehow amalgamate the best of both stage and cinema. What if you could bring all the power and artistry of movie cameras and beautiful sets and scenery and combine them with live, unrecorded musical performances? That would, in theory, allow actors to do what they do best, to squeeze their heart and soul out of every part of their performance, unencumbered by choices made weeks or months before in a dark recording studio, before they were endowed with costumes and makeup and props, before they had been introduced to their fellow actors, before they became intimately familiar with the characters they would bring to life, and before the story they were telling had woven itself into the very fiber of their beings. What we experience, then, is as powerful visually as it is musically, sight and sound serving as symbiotic partners in a stunning sensory presentation. Hugh Jackman does the yeoman work of stringing all the story’s parts together as Jean Valjean. His singing and his acting are strong -- as they are for the vast majority of the cast -- and he easily earns our sympathy as we watch him struggle against seemingly insurmountable odds. Anne Hathaway as Fantine is heart-breakingly believable, and the power of her performance of I Dreamed A Dream is pure and poignant. Helena Bonham Carter and Sacha Baron Cohen play the delightfully wicked Thénardiers. And while Helena Bonham Carter is wonderfully versatile in nearly everything she does, I typically have little use for Cohen. With the exception of his work in Hugo and the Madagascar films, most of what he brings to the screen is at best tripe, crude and intentionally offensive with no real redeeming value. His work here, however, is spot-on. Their rendition of Master of the House at once paints an appropriately sordid picture of the squalid state of society whilst being highly amusing and entertaining, and providing much-needed comic relief to an otherwise dark and heavy story. Aaron Tveit is appropriately charismatic as the rebel leader Enjolras, and Samantha Barks will rip your heart out as Éponine. Amanda Seyfried as the grown-up Cosette will melt even the hardest heart, and young Daniel Huttlestone as Gavroche almost steals the movie on more than one occasion. Eddie Redmayne as Marius delivers a show-stopping rendition of Empty Chairs at Empty Tables that will have you digging in your pockets for tissues. And there are countless other actors whose names I do not know but whose performances are nonetheless amazing. In fact, the group number of Do You Hear the People Sing? will make you want to stand up in the theater and start waving a flag or something, that is if you can stop crying. So this brilliant movie is filled with incredibly talented songbirds, whose individual and collective voices weave a musical tapestry that has scarcely been assembled previously on the big screen. Which is what ironically makes Russell Crowe’s name particularly appropriate as he squawks his way through song after song as Javert with merely adequate results. In certain circles, Crowe might be considered a reasonable singer, but certainly not when he is surrounded by a legion of top-shelf talent. But this is a minor squabble; I like Russell Crowe, but I wish he had gone a little Rex Harrison and talk-sung his way through these numbers. Harrison could hardly sing a note, yet is remembered fondly and perhaps best for his roles in some rather meaty musicals! 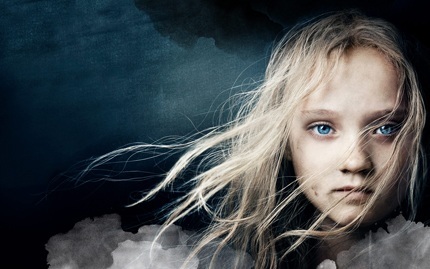 Les Mis is long, but doesn’t feel like it. Its message is heavy and thought-provoking and, at times, depressing. But it is also a powerful story of perseverance, and there is a strong undercurrent of hope that flows throughout. It is a remarkably timeless reminder that despite the bleak backdrop of life in a fallen and failing world, we need not surrender to despair and depravity. Simple acts of kindness and charity can change lives and, indeed, the world. And when we rise above our natural tendencies, then redemption and atonement are within the grasp of all of us, and the soul that we save may well be our own.